Fractional laser technology was first described in 2003, and a year later, the first fractional laser device debuted for clinical use on patients. Fractional technology works by targeting a fraction of the skin at a time with a laser beam, dividing the skin into thousands of microscopic treatment zones. These zones are very small and treatment of the skin would be analogous to enhancing or altering a digital photographic image pixel by pixel. Although these treatment zones are tiny on the surface, they run deep below the surface in columns. These columns, which are formed by the penetration of fractional lasers, undergo reactions that eventually give rise to smoother and more youthful-appearing skin. Fractional laser skin treatment techniques fall into two categories: non-ablative and ablative. Non-ablative techniques work mainly in the area of the epidermis, or outer layer of skin, while ablative techniques work mainly in the dermis, or middle layer of skin. Additionally, fractional laser technology can be combined with surgery and other skin treatments such as chemical peels, BroadBand Light (BBL™), and SkinTyte™. How Does ProFractional Treatment Help with Acne Scarring? The ProFractional™ laser system is the latest cutting-edge rendition of fractional technology and has gained popularity as a laser treatment for acne scars. This laser therapy for acne scars is unique, because it has the ability to penetrate both the epidermis and dermis of the skin. Unlike other treatments that remove the entire layer of skin in the treatment area, the ProFractional laser’s penetration creates thousands of microscopic channels in the targeted zones of skin. The areas of healthy, untreated skin surrounding the channels augment the healing of the treatment areas. Additionally, the laser’s energy causes a reaction that stimulates the natural production of collagen, which plumps the skin from within and fills in irregularities caused by acne scarring. As a result, the ProFractional laser may be the best acne scar removal system available today. The benefits of ProFractional laser treatment for acne scars include increased patient comfort, faster healing and shorter downtimes, and tunable results in regards to depth of laser penetration. Additionally, ProFractional lasers differ from other lasers because of their ability to target imperfections and treat microscopic areas of the skin. All these benefits combine to make the argument that the system is perhaps the best laser treatment for acne scars. How Many Profractional Treatment Sessions Do Patients Generally Need? 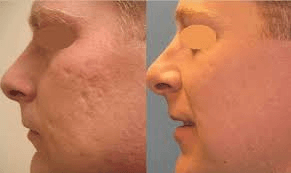 The ProFractional system provides excellent laser resurfacing of acne scars. The laser can be adjusted for a few deep treatments with more downtime or multiple lighter treatments with less downtime. Laser treatment for acne scars via the ProFractional system is typically done in a series of 1 to 4 treatments spaced 3 to 6 weeks apart, depending on your needs and response to treatments. In addition to filling in acne scars, the laser also improves skin tone, smoothes out lines, and evens out discoloration in the treatment areas. What Can Patients Expect During the Procedure/Treatment Sessions? Are There Any Side Effects? Laser treatment for acne scars with the ProFractional laser is gentle, non-invasive, and safe. There should be minimal discomfort during the treatment. Medical personnel may use combinations of topical numbing creams, mild sedatives, and/or local injections of anesthetics to keep you comfortable throughout the procedure. However, this varies from patient to patient and depends on the depth of the treatment. ProFractional procedures take anywhere from 30 to 45 minutes depending on the condition of the skin and the size of the area being treated. Most patients have very little to virtually no pain after the treatment. Common side effects include redness, swelling, itching, flaking, and a sunburn-like sensation. You will have minor skin flaking and itchiness the following day. By day two, the redness will begin to fade, and by day three, any redness can be easily covered by makeup. Incidental pinpoint bleeding may also occur, which will subside within a short time after the procedure without any intervention. Occasionally, patterned areas of increased pigmentation may appear but will typically resolve in a few days. You will be sensitive to ultraviolet (UV) light, and you must avoid direct sun exposure until fully healed. Sun tanning and tanning beds should be avoided for 1 month before and after each treatment. Before fractional laser technology was introduced, recovery from older carbon dioxide-based laser therapy for acne scarring could take up to a whopping 6 weeks! Now, the healing process varies from patient to patient but will generally take 3 to 7 days, with gradual improvement each day. You will continue to see improvement in the treatment area(s) for up to 6 months as new collagen fills in the acne scar defects. If you are bothered by acne scarring and want to do something about it, contact Precision M.D. today for a free consultation to see if you are a candidate for treatment with the ProFractional laser.